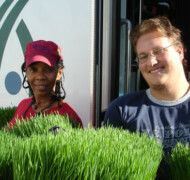 The Wonders of Wheatgrass – Good for You and Good for Our Community. . .
Two ounces of wheatgrass juice has the nutritional equivalent of five pounds of the best raw organic vegetables. Stop in for a visit and tour our facility or simply purchase the organic wheatgrass product of your choice. We carry wheatgrass by the flat, organic seeds if you prefer to grow your own plus powerful juicers to juice at home! Your purchase supports the nearly 700 children and adults with intellectual and developmental disabilities in ARCA’s care. 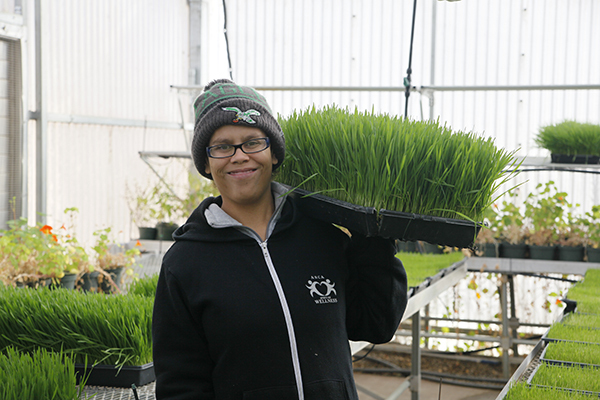 ARCA’s Wheatgrass is grown without the use of pesticides, herbicides or fertilizers and has organic certification from the New Mexico Organic Commodity Commission (NMOCC). Organic certification means that ARCA Organics follows all federal and state regulations for organic growing. We provide the finest quality, certified organic wheatgrass to juice bars, smoothie shops and grocers throughout the greater Albuquerque area. 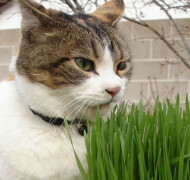 GRAZERS wheatgrass for pets is a pure source of nutrition for your pets. Wheatgrass is known in the health food industry for its high nutrient content and healing properties. It can supply essential vitamins and minerals many pets are missing in their diets. GRAZERS can be found at several locally owned pet food stores throughout Albuquerque. 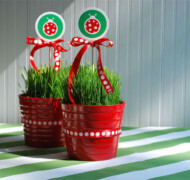 Liven up your home, office or special event with living wheatgrass centerpieces! Wheatgrass provides a natural and unique accent to weddings, fundraisers, meetings and much more. If you have questions regarding ARCA’s Organic Wheatgrass or would like to place an order for one of our products, please use the form below or call Carmelle Sabater at (505) 898-5518. Using the right juicer to process wheatgrass is very important if you want to extract the most benefit from the plant. Using a blender or processor will oxidize the chlorophyl, making it less potent. Wheatgrass juice should be made fresh, using the freshest sprouts for best taste, and consumed within a half-hour after extraction. Wheatgrass flats and juicers are available for retail sale at our greenhouse. We offer two juicer varieties. The Manual HealthyJuicer™ is rugged, efficient, easy to clean, and affordable. The Electric HealthyJuicer™ is ideal for multipurpose use, juice wheatgrass, fruits, veggies, and even make pasta and nut butters! …and many other nutrients, vitamins, amino acids and minerals essential for a healthy diet.